Coffman Specialties, Inc., in the ten-year history of the company, has a proven record of growth. As the company has grown, so has its fleet of GOMACO pavers and equipment. 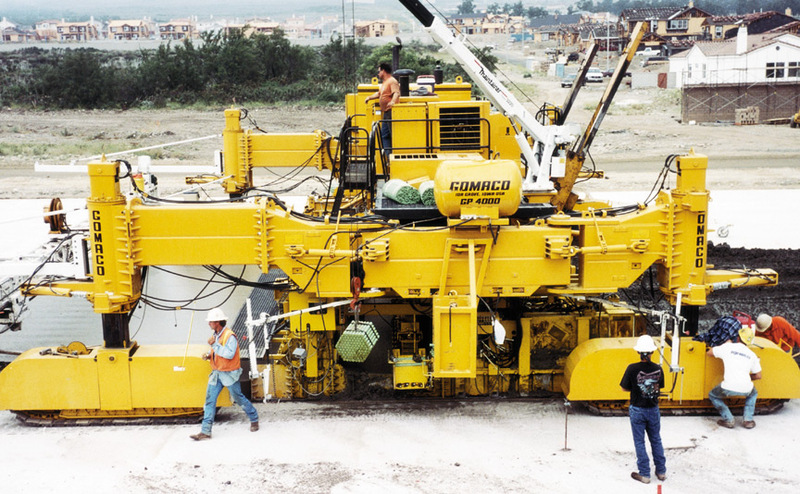 The company's latest acquisition is a GP-4000 paver, GOMACO's largest slipform paver, complete with the In-The-Pan Dowel Bar Inserter (IDBI) and AutoFloat®. "We keep using and purchasing GOMACO equipment because they have the most versatile product lines that fit the needs of our work," Colleen Coffman, president of Coffman Specialties, said. Coffman's first project with the GP-4000 began in May in Fontana, California, on Route 30. The route will be paved in three continuous sections and will be a new east/west artery into Los Angeles helping to relieve congestion on two other roadways, I-10 and I-60. The total cost of the project is approximately $117 million. By the time the project is completed, four miles (6.4 km) and 123,000 yd3 (94,041 m3) of concrete will be slipformed 65 feet (20 m) wide and 11 inches (279 mm) thick. The new roadway is being slipformed over two different bases, one is an asphalt-treated permeable base and the other is a lean concrete base. The GP-4000 is set up to make 38.5 feet (11.7 m) wide paving passes. A concrete mix consisting of 80 percent cement and 20 percent fly ash is being used. Average slump is one inch (25 mm). This was also Coffman's first project with the IDBI. Tom Bell, product improvement manager for GOMACO, said, "The IDBI is GOMACO's patented system of putting dowel bars into a concrete slab during the paving process. Our engineers designed a complete system that is accurate and user-friendly, while assuring the contractor has a piece of equipment that can be adjusted to provide exacting tolerances for any job specification. The In-The-Pan Dowel Bar Inserter is far superior to others on the market for accuracy in bar placement location, productivity and meeting rideability specifications. "It has been an evolutionary process to get to a system like the one Coffman's are working with today. Over two decades, we have sent out field representatives and engineering and research teams to the job sites to study our dowel bar insertion process and make improvements to assure our system continues to be the most advanced and operator-friendly dowel placement method in the industry. Inspectors and civil engineers expect accuracy in the bar location in the slab and contractors wanted the process incorporated in the paver without huge transport and setup demands. "The IDBI does this. It fits under the paver's standard length, between the tracks, and doesn't require the massive rear extensions to the frame of the paver that some DBI's require. 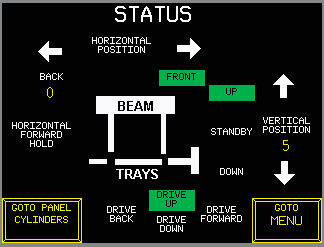 "The computer control system that GOMACO has developed for this manages all the systems in an easy to understand display," Bell said. "It has made this multiple-task process very simple to set up and operate. Our bar placement takes place after the concrete is vibrated. There is just no way that you can place bars ahead of the vibration and expect accuracy in depth and location. "We're pretty proud of this system. GOMACO has been committed to providing leadership in the dowel bar insertion process. That's why everything in the system has a unique design for its special purpose." "The start-up went perfect," Coffman said. "As soon as we started off the header, we got a good product," Bell said. "The IDBI functioned without a hitch and we didn't have to make any adjustments after we started. That's a good start-up." The IDBI was placing 1.5 by18 inch (38 by 450 mm) dowels 12 inches (300 mm) apart. The bars are inserted down through half the thickness of the slab, or 5.5 inches (140 mm), with random spacing of the joints. GOMACO's exclusive computer-controlled smart-cylinder technology provides the state-of-the-art system to maintain the accountability of the depth of the bars upon insertion into the slab. Tie bars for the longitudinal joints are also being inserted into the slab at 24 inch (600 mm) spacing. The bars were inserted using either front- or rear-mounted bar inserters. "The location of the tie bars changed depending on the direction they were paving," Bell said. "On the first pass it was the rear bar inserters and on the return pass, we used the front bar inserters. The IDBI computer's programming provided us with the option of doing either one." GOMACO prides itself on having an operator-friendly IDBI computer. 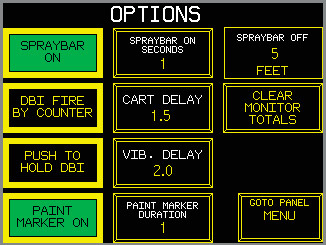 The computer controls the timing and operations of the IDBI functions, including sending the trolley, positioning the IDBI in standby, and activation of the IDBI system for bar insertion. Presetting and adjusting joint spacing for IDBI activation is easy to understand and simple to program. Bar inserters for longitudinal joints can be programmed and controlled through this same system. The operator has to know exactly where the IDBI is during the paving process. The touch screen for the IDBI menu was designed with that in mind. "The IDBI menu is operator friendly. It's simple and easy to follow," Coffman said. "The layout is good and the cover over the display screen makes it easy to read." Coffman decided to buy an IDBI to offset California's rising costs. "The IDBI offers us the access to grades at the desired widths," Coffman said. "It's also more cost effective. It offsets the cost of buying baskets and then having to set them, which is a huge time and labor savings." Coffman's IDBI will place approximately 335,000 dowel bars in the four mile (6.4 km) stretch of new road. California rideability specifications call for a smoothness rating of seven inches per mile (110 mm/km) using a California profilograph. Coffman's have been averaging two inches per mile (32 mm/km). Their GP-4000 paver is equipped with an Auto-Float® which applies the final finish behind the IDBI. A burlap drag follows behind the Auto-Float with a GOMACO T/C-600 texture/cure completing the process by applying a longitudinal tining. The new section of Route 30 is scheduled for completion this year. Coffman's will then load their GP-4000 with IDBI onto trucks with lowbeds and transport it to Phoenix, Arizona, for work on the north runway at Sky Harbor Airport. After that, it's back to Route 30 to complete two more segments of the highway. The May 2000 issue of Construction Equipment magazine honored Coffman Specialties with its Up and Comers distinction. 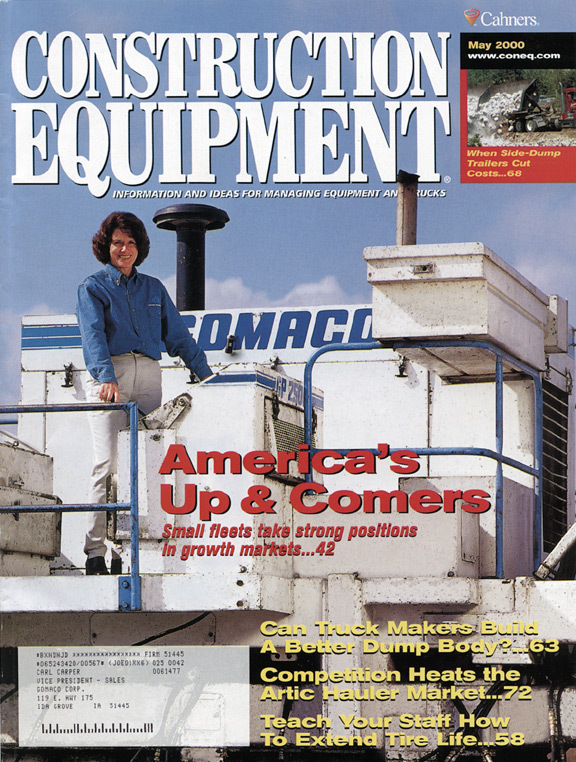 The magazine cited Coffman's explosive growth since the company was established in 1991. In Coffman's first year of business, the company had a $320,000 income. The next year, their income jumped to $6.2 million. Annual growth has averaged 35 percent per year since then. This year's estimated billings are projected to be more than $30 million. "Our company's professionalism and personalized approach to the needs of each general contractor client distinguishes our company from others in the business," Coffman told the magazine. "Project needs and requests of our customers receive top priority from all members of our organization." GOMACO would like to congratulate Coffman Specialties on earning this distinguished recognition. The IDBI has operator-friendly, touch screen controls and programming that gives the operator quick and easy control over the entire operation. These three screens are samples of some of the touch screens. 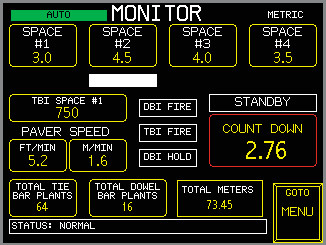 The computer is responsible for controlling the time and operation of the IDBI functions, including the sending of the trolley, positioning the IDBI in standby, and activation of the IDBI system for bar insertion. At the touch of a fingertip, the operator can see exactly where the IDBI currently is in its cycle.